Matron's got her Mojo back! A trip to the garden centre to get some soil based compost for a number of raised beds. After lots of searching for appropriate containers to grow veggies I found these vegetable planters on the RHS website shop. A strong fabric liner with drainage holes, and a lovely willow woven surround. I can see veggies being very happy in these planters. Filled them up with a mixture of this soil based compost with a thick layer of leafmould and garden compost down in the middle to help retain moisture. Shade has always been the issue in my new veggie garden. You can see here the left side of the picture is South facing, but you can see where the shade is. Remember this is only February and the sun will get higher as the season progresses. Fruit and veggies which produce above the ground like tomatoes, chillis, courgettes and pumpkins need full sun. I will place them on the left side against this South facing wall. Leafy vegetables like cabbage, spinach, broccoli and lettuce can take an amount of shade, as can root vegetables like beetroot, carrots and potato. I can find some space against East or West facing walls to place these crops that can tolerate some shade. This Tayberry seems to be settling down well after the move from my old allotment. Up against a West facing wall it should do well. Raspberries and other soft fruit can also tolerate some shade, but they need to be kept fairly moist and do not like to dry out. I will have to be careful here because areas next to a wall tend to be quite dry. I also took a few crowns of Rhubarb from my old allotment. It has been a very warm Winter here in the UK and this started to shoot up last November! I will feed it and not take any crop from it this year, allowing it to settle down and develop a root system. This is also against a West facing wall, I will have to be careful not to allow it to dry out. Matron has found her Mojo again! Here's something different. 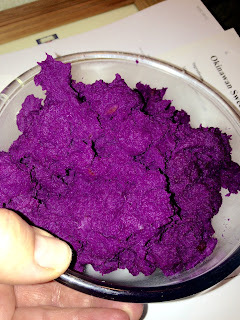 I first came across these Purple Sweet Potatoes when I had family visiting Hawaii. Known originally as Okinawa sweet potato (from Japan) they seem to be gaining in popularity. Sold in the USA as 'Stokes' purple, it is now available at Waitrose as a Stokes Sweet Potato. I found these at my local Chinese supermarket, they are seasonally available between September and March. They maintain this amazing colour when cooked, and contain the same chemicals as found in blueberries, blackberries and other purple fruit and vegetables 'anthocyanins' You can use this sweet potato when cooked for an amazing range of brightly coloured dishes, cakes, muffins, ice cream or just mashed as a veggie. They have a dry, firm texture and a lovely sweet flavour which I think tastes like sweet chestnuts. They are delicious! So, this recipe from Hawaii is the most delicioius thing you can imagine, and if you can get hold of some sweet potatoes I highly recommend you google for 'Okinawa Purple Sweet Potato Haupia Pie' The 'Haupia' refers to the sweet coconut milk topping that goes on top. Bake in an oven gently till the sweet potato topping is just cooked. This mixture is a little bit like a pumpkin pie mixture. When it is completely cold you make a thick coconut sauce with a tin of coconut milk, sugar and cornflour. Pour this thick sauce over the top of the sweet potato topping and allow to cool completely. I am quite a foodie, and enjoy growing and cooking all sorts of fruit and veggies, but this has to be one of the tastiest things I have made! If you can get hold of some purple sweet potatoes, then you must make this! It tastes amazing!... Now I am going to see if I can grow some shoots on the remaining sweet potatoes and try to grow some in my garden!..